Pathfinder Build: Seats getting built. 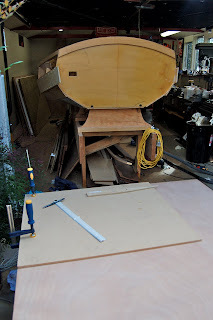 Now I have the 3rd row of planks on I have decided to mock up and fit seats. They are made of 18mm Gaboon which will be glassed over. Pat tries out the seating arrangement. Making progress.